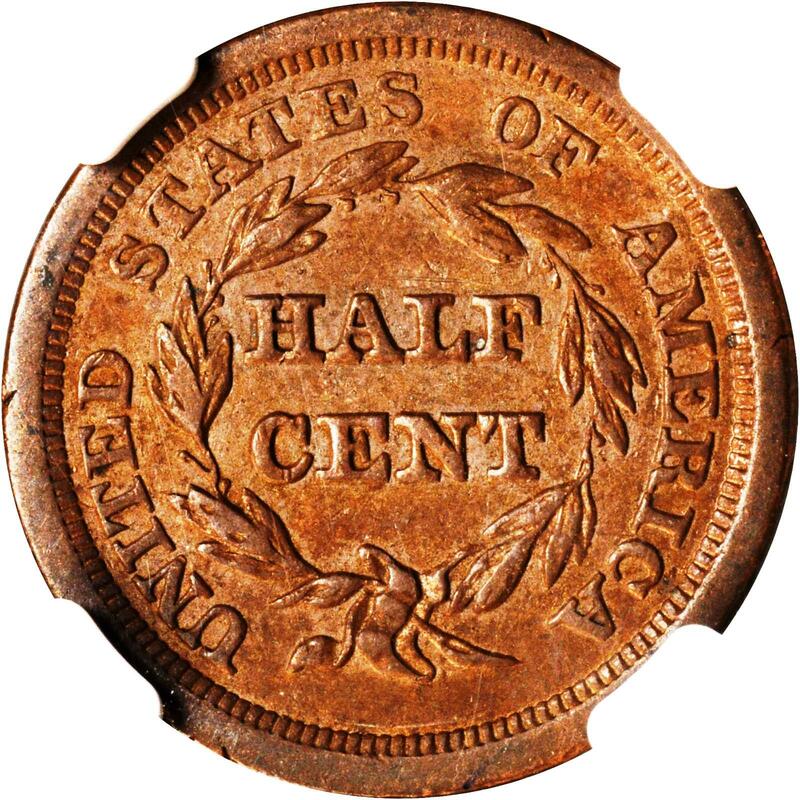 Half cents: The smallest denomination ever produced by the United States government. They circulated in this country from 1793 to 1857, after which they were abandoned and the cent became the smallest denomination in commerce. 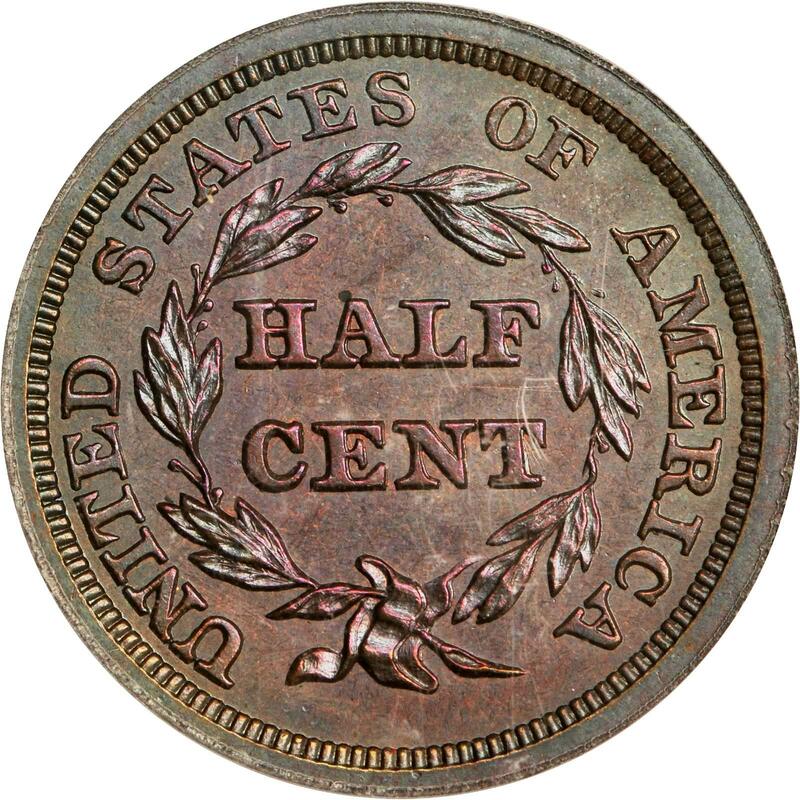 While a half-cent coin did not buy much even when it was circulated, it still played an important role in commerce, as cigars at the time cost 4 and a half cents, a shot of whiskey was 12 and a half cents, and many other goods were often priced in half-cent increments as well. 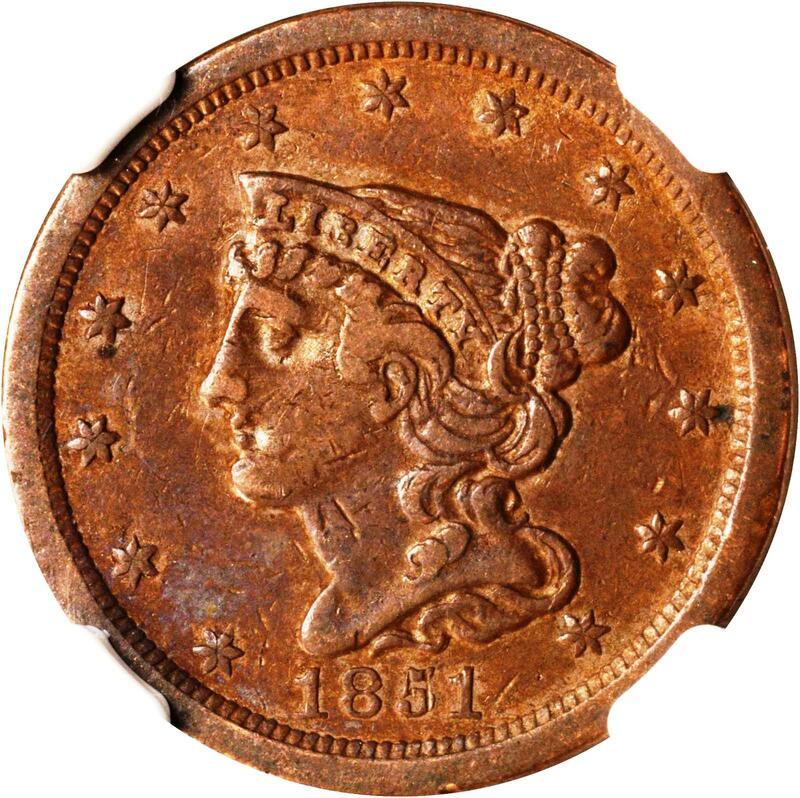 Today, however, the denomination is mostly forgotten, except by coin collectors — some of whom still cherish these “little half sisters” and actively collect them. In this article, we will take a look at five coins of this denomination that a collector on a budget of $100 can still afford to buy. Despite relatively small mintages, this series still offers a lot of bang for your buck, and a small collection can still be assembled relatively easily. 1804 Draped Bust half cent. C-8. Rarity-1. Spiked Chin. AU-58+. CAC. 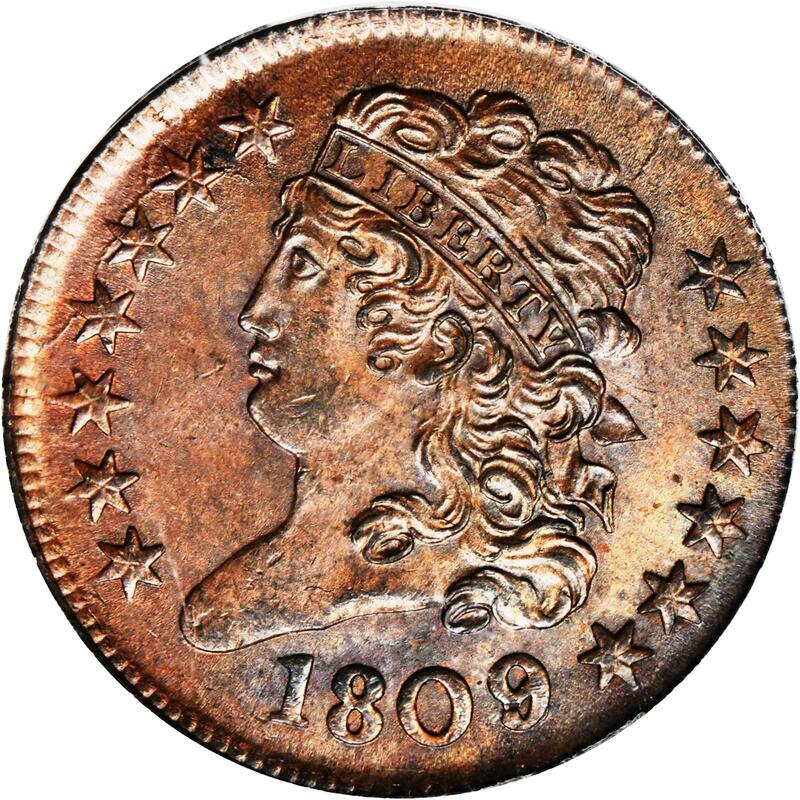 The 1804 Spiked Chin Draped Bust half cent is an interesting variety that most likely was created by accident. One obverse die used for minting 1804 half cents had damage to it, which shows up as a spike coming out of Liberty’s chin. The general consensus is that a screw or a similar object that was accidentally dropped on top of the die. It happened as the die was already in production, as a few (very rare) examples of the same obverse die are known to exist without the damage. While scarce, it is still possible to find examples of this very interesting and noteworthy variety (which is also listed in the Red Book), with $100 buying you a problem-free VG or so. Note that during production this obverse die was paired with various reverse dies, and some combinations are very rare and much in demand with variety collectors. Spend a little more: This variety gradually goes up in value in the higher grades, but it is not rare until you get to the Uncirculated level. A nice VF with plenty of detail remaining and original surfaces will probably set you back right around $250 and makes for a nice purchase of one of the more obvious “accidents” from the early Philadelphia Mint. 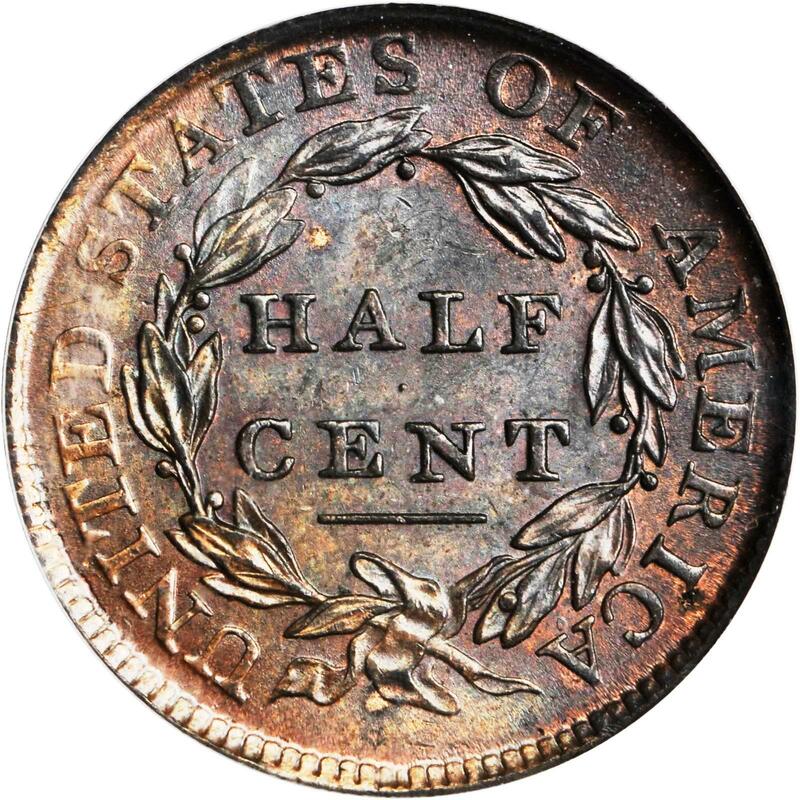 1809/”6″ Classic Head half cent. C-5, B-5. Rarity-1. Manley Die State 1.0. 9/Inverted 9. MS-65 BN. CAC. OGH. 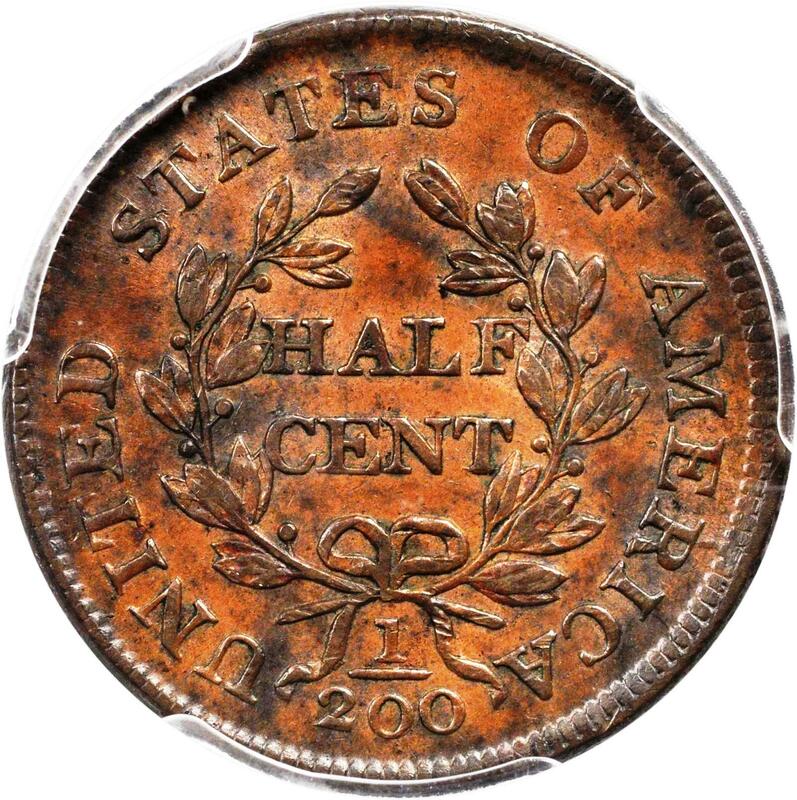 The Classic Head half cent was introduced in 1809, and the first year various interesting varieties were created. One of those was previously known as the 1809/6 overdate, but since that is unlikely as this design was not created until 1809, it is more accurately called the 1809/inverted 9. The only such variety in the Classic Head series, it is quite scarce, but not impossible to find. A decent Fine can be found for about $100, and if you focus on finding one with an early die state even at that grade level the so-called “overdate” should be clear enough to see under magnification. Spend a little more: This variety never really becomes expensive, and even in VF/EF it costs only about $250 if you spend a little bit of time searching. Another interesting variety of this year is known as the 1809 “Circle in 0,” which was created when a zero from a digit punch meant for a smaller-sized denomination was used and then instantly corrected. Much scarcer, expect to spend at least a couple hundred dollars for a low-grade example, and regardless of grade they are very difficult to find. 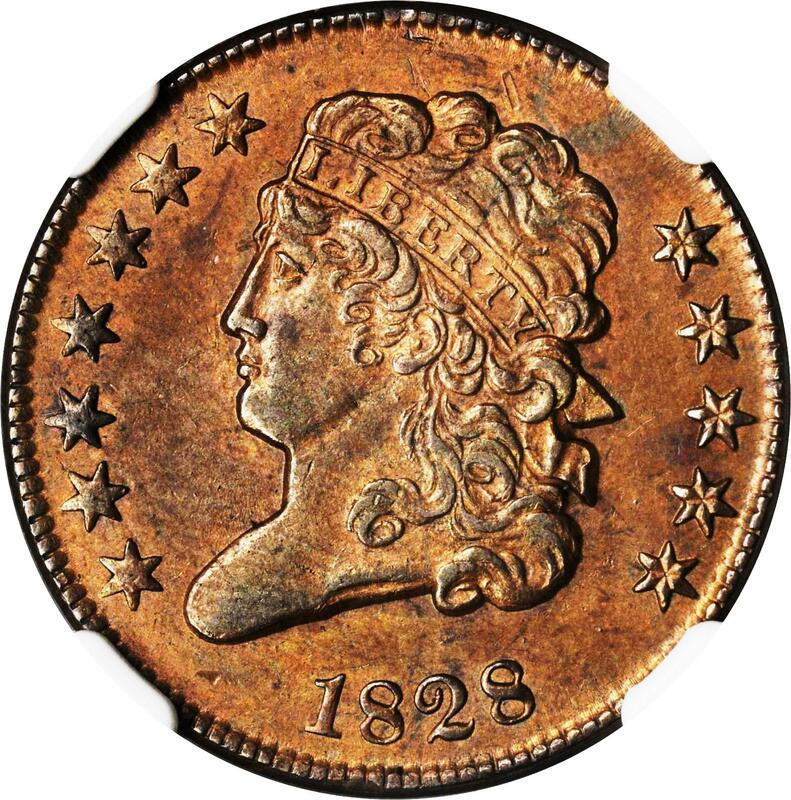 1828 Classic Head half cent. C-2. Rarity-2. Manley Die State 2.0. 12 Stars. MS-62 BN. Counting can be difficult, even for workers at the Philadelphia Mint in 1828. That year, one of the obverse dies had only 12 stars instead of the customary 13, representing the original states. Someone didn’t notice until after the die went into production, or people did not care, and a sizable quantity was struck and released into circulation. One of various such varieties known to exist, it remains a very popular variety with collectors, but thankfully a decent Fine can still be found for right around $100, making for an interesting conversation piece. Spend a little more: Even though you can spend more and upgrade in quality, consider buying both the 12 Stars and 13 Stars varieties to make for a nice comparison pair. The 13 Stars variety is easier to find, also in higher grades, and if you stick to the $100 budget you should still be able to find a nice EF. 1851 Braided Hair half cent. C-1, the only known dies. Rarity-1. EF-40 BN. 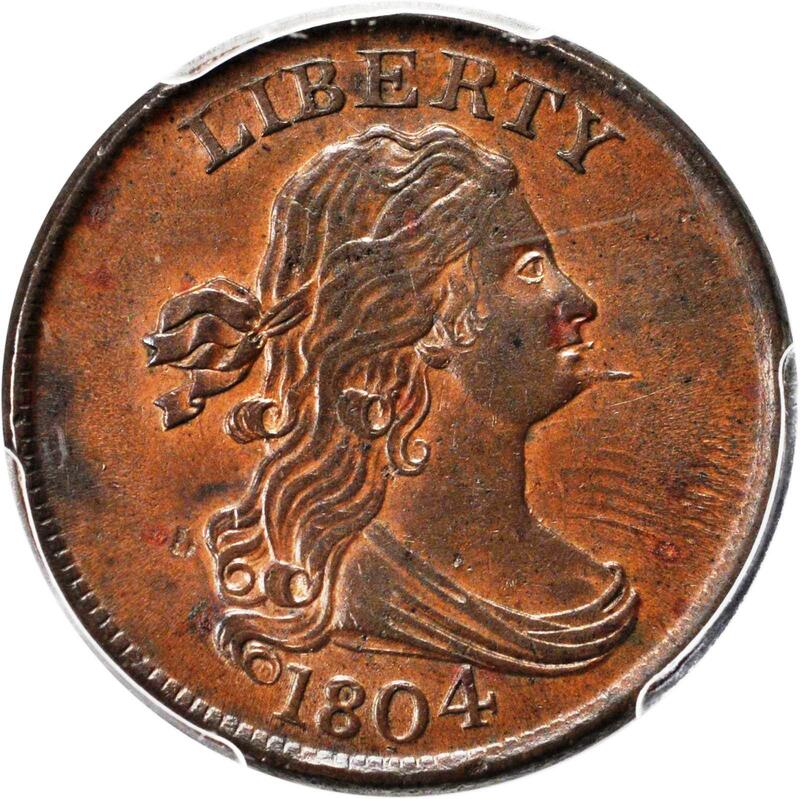 In 1849 the Braided Hair half cent was introduced for circulation after the design had been in use on large cents for a decade (in the 1840s, Proofs were struck of this design on half cents, but they are all very rare). At this point, half cents were less and less in demand and mintages dropped sharply, usually being below 50,000 coins each year. 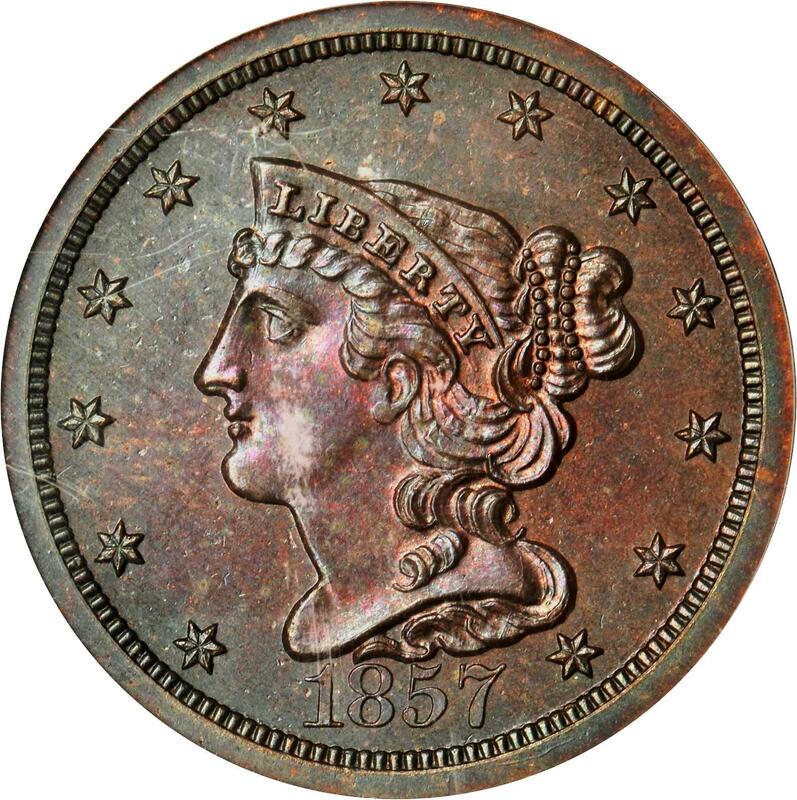 1851 was a notable exception, as that year 147,672 coins were struck for circulation. The perfect type representative, examples can easily be found in most grades, and an original, appealing EF is certainly possible for $100, making this one of the more affordable half cents. With a little bit of searching and some luck perhaps even a low-end AU is possible. Spend a little more: If you are willing to spend about $300 or so you should be able to find a graded MS-63 BN. Such pieces are always in demand with type-coin collectors, but it gives a lot of value for your money, as prices go up exponentially in higher grades. With MS-63 RB pieces going for $450–$600, try to find a coin graded with the “brown” color designation but some original Mint red color remaining, and you will have a nice, high-quality piece of this obsolete denomination. 1857 Braided Hair half cent. C-1, B-2. Rarity-4. Proof-64 BN. 1857 was the end of an era. 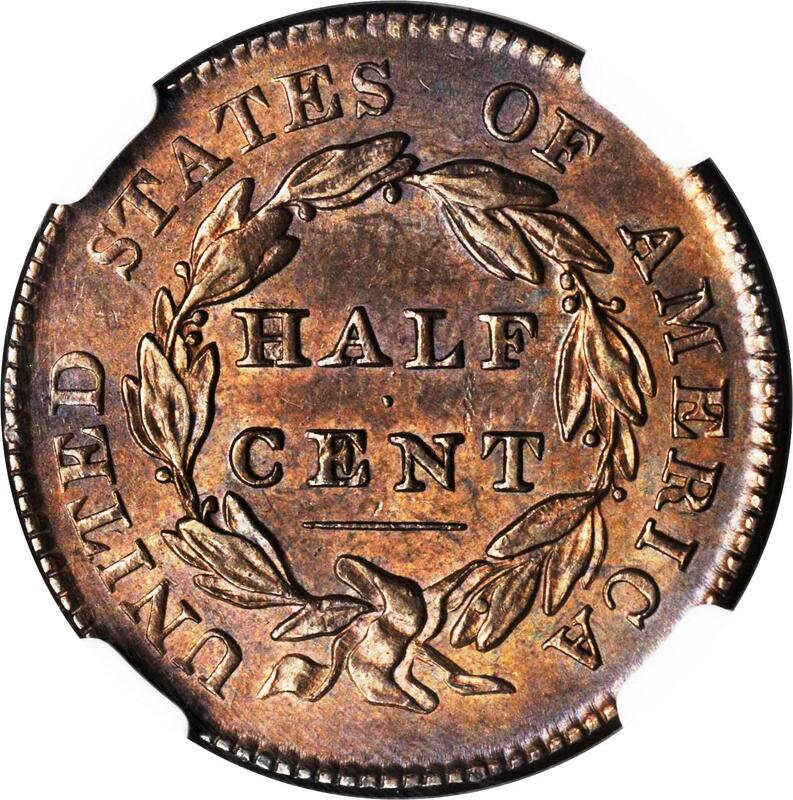 That year, amid rising copper prices and inflation, the large cent was replaced by a smaller cent with a Flying Eagle motif, and the half-cent denomination was discontinued altogether. The final year a total 35,180 pieces were struck for circulation. Quite a few were saved, however, and this date is not as rare as the mintage would suggest. For $100 you should be able to buy a VF, but as these circulated for a relatively short time it might take you some time to find one at that grade level. Spend a little more: EF’s and AU’s are easier to find of this date than lower-graded examples, but you’re still going to spend a little bit more money adding one to your collection. An EF will cost right around $150, while an AU will set you back around $200, slightly more once it approaches the Uncirculated level.